In the early morning hours of November 11, David MacDonald, a veteran of the Second World War, stands outside his Cape Breton home, preparing to attend what will likely be his last Remembrance Day ceremony. As he waits for the arrival of his son and grandson, he remembers his decision to go to war in desperation to support his young family. He remembers the horrors of life at the frontlines in Ortona, Italy, and then what happened in Holland when the Canadians arrived as liberators. He remembers how the war devastated his own family, but gave him other reasons to live. What emerges is an elegant, life-affirming meditation on "how the present always comes out of the past," and how even in the midst of tragedy and misfortune there exists the possibility for salvation. 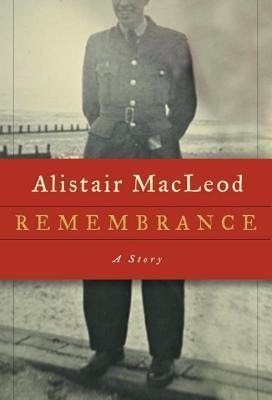 In just a handful of pages MacLeod created an exquisite story depicting one man’s decision to join up during the Second World War. It is astonishing how much detail was packed into so few pages while still taking the time to describe the surroundings. I got as much information about David MacDonald’s home country as I did about his specific choices for himself and his family. The three generations of David MacDonalds, grandfather, son and grandson are brought together to attend a Remembrance Day Ceremony, perhaps the grandfather’s last. The mere fact that the grandson is making the journey to Cape Breton to support his grandfather explains the purpose of this poignant short story. The bond between the three generations is clear while being expressed in a way one would expect men to express themselves- the dialogue between them is brief but one wouldn’t be surprised by any more. What is most unusual perhaps, is the insight into the life of grandfather during that brief period we are given to read. This short story was perfect and I could have happily read so much more- this author's writings will be missed.